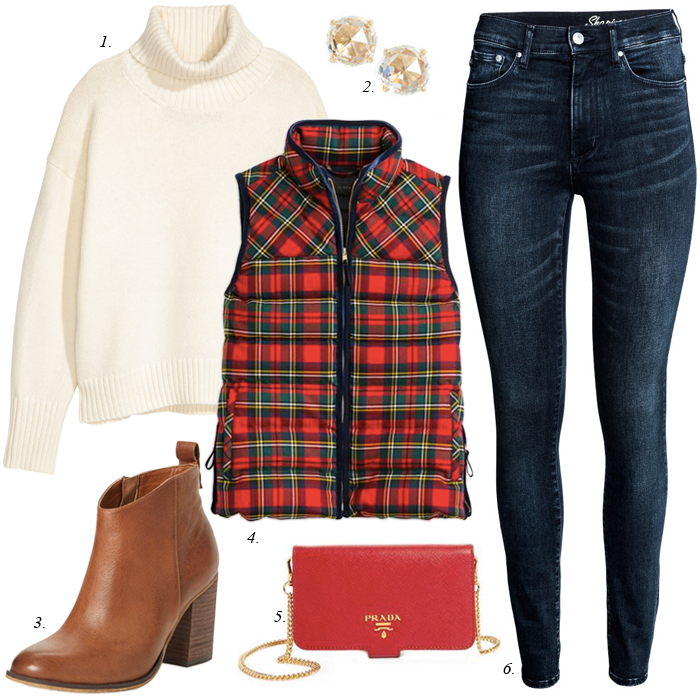 A red plaid puffer vest look - that is a festive yet casual outfit for the season. I found some plaid vest options for as low as $15 - listed in my finds & deals below. Today, is Green Monday - supposedly the day for last minute shopping and great deals. I am not sure I need to do anymore shopping - but if the deal is right - I just might. Has anyone else found shipping to be extremely slow this year? I am still waiting for some items that I ordered over Thanksgiving. Anyone else still waiting? This is a twist on a classic hooded sweatshirt that is only $25. These are the cutest party pants - and they are a great price on sale. This new lace up sweater is under $30. This blush pom pom knit hat is only $10. This plaid puffer vest is $15. This quilted red plaid vest that is only $35 (with free shipping). This buffalo plaid vest is on sale for $20. This fuzzy cardigan is only $33 - and looks so warm. This faux fur jacket is $55 - with free shipping. This fleece/shearling vest is a great price on sale. These tartan plaid shearling slippers are on sale for $25. This popular quilted jacket is more than 50% off. These fun stars and stripes sock set would make the perfect stocking stuffer. This buffalo plaid shirt is 45% off. I just bought this lip gloss set. This striped turtleneck sweatshirt is on sale for $20. I shared my top 10 funny gift ideas HERE. I know - I wish I had bought one, too - the price was too good. Thanks for this post. I immediately went and ordered the plaid vest for my daughter's Dec. 24th birthday! I hope she loves it! I am so glad you got the vest! I hope your daughter loves it. What a special day for a birthday. I love that vest!!! I have a hard time buying holiday things because they can only be worn during the season, but they're so cute! I agree - so cute for Christmas. Such a cute outfit! Loving the plaid vest! Thanks. I am loving the plaid, too. If only I could have all the vests! This one is perfect for this time of year! Me, too. The plaid is perfect for Christmas. Super cute! Love that vest! I've seen a few vests like this in store but never knew what exactly I would wear with it. This is the perfect inspiration! I should have bought the dang vest, LOL. Thanks for sharing! Love that puffer!! Such a great look dear! !